Mbarara is a city in the Western Region of Uganda. It is the main municipal, administrative, and commercial centre of Mbarara District and the site of the district headquarters. Mbarara came from behind and developed to surpass Entebbe, Masaka, Gulu, and Jinja as the second-largest city in Uganda after Kampala and also second to Kampala in importance, industry, and infrastructure, 3rd largest town in Uganda by population after Kampala and Kira and the fastest growing town in Uganda followed by Gulu. On 7 August 2015 the Uganda cabinet approved Mbarara Municipality alongside other 5 municipalities to be  granted a city status. Due to a rapidly expanding population, the current water supply from nearby River Rwizi is insufficient to meet the future needs of Mbarara City. The Ugandan government has borrowed €120 million to source water from the Kagera River purify it and pump it to Mbarara, Masaka and Isingiro District. As part of the modernisation of the Mbarara-Katuna Road (2011 - 2015), a new northern bypass road is planned for the town. The bypass will start from the Coca-Cola Plant on Mbarara-Masaka Road at Makenke, pass through Rwebishuri and Nkokonjeru and join the Mbarara-Kabale Road at Katatumba Resort, about 5 kilometres (3.1 mi) southwest of the central business district. The bypass is expected to decongest the city centre by taking the long-distance trucks destined for and coming from Rwanda, Burundi, and the Democratic Republic of the Congo off of Mbarara's city streets. The 14 kilometres (8.7 mi) road is expected to cost about €170 million (US$210 million), of which the European Union is expected to lend about €122 million (US$153 million) with the government funding the balance from its own resources. Ruharo Mission Hospital- An Anglican-based 100 bed hospital located at Ruharo Cathedral, has the best Eye-care center in the whole region. Bishop Stuart University - A private Christian University, affiliated with the Church of Uganda located in Kakoba division. ^ "Map Showing Kampala And Mbarara With Distance Marker". Globefeed.com. Retrieved 21 April 2014. ^ Google (1 July 2015). 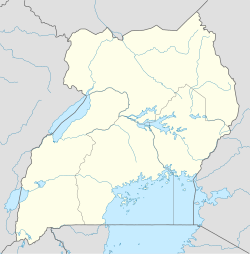 "Location of Mbarara at Google Maps" (Map). Google Maps. Google. Retrieved 1 July 2015. ^ "Estimated Population of Mbarara Town In 2002, 2010 & 2011" (PDF). Uganda Bureau of Statistics. Archived from the original (PDF) on 7 July 2014. Retrieved 21 April 2014. ^ Pelikan, Archive (30 July 2013). "Mbarara The Second Largest City In Uganda". Pelikan. Archived from the original on 4 April 2015. Retrieved 31 March 2015. ^ AllAfrica, Archive (4 April 2004). "Mbarara gets a 2 Billion hospital". All Africa. Retrieved 31 March 2015. ^ AllAfrica, Archive (3 April 2004). "Museveni launches Mayanja Memorial Hospital". All Africa. Retrieved 31 March 2015. ^ "About ULGA". Uganda Local Governments Association(ULGA). Retrieved 21 April 2014. ^ Monitor Team (29 March 2019). "How are 9 municipalities prepared for city status?". Daily Monitor. Kampala. Retrieved 31 March 2019. ^ Jean Marie Takouleu (6 February 2019). "Uganda: AFD invests €270 million in two water and sanitation projects". Paris, France: Afrik21. Retrieved 31 March 2019. ^ SoftPower Reporter (6 November 2018). "Government To Borrow Over One Trillion For Water Sanitation Projects". Kampala: SoftPower Uganda. Retrieved 31 March 2019. ^ Newvision, Archive (26 May 2010). "Mbarara Gets Sh459 Billion Bypass". New Vision. Archived from the original on June 1, 2010. Retrieved 21 April 2014. ^ Wafula, Paul (11 February 2012). "South Africa Firm Plans To Invest Sh6.5 Billion In New Brewery". Daily Nation. Retrieved 21 April 2014. ^ "SABMiller Opens Second Brewery In Uganda". ShareCast.com. 22 August 2013. Archived from the original on 14 February 2016. Retrieved 21 April 2014. ^ Vision, Reporter (24 September 2012). "China To Build US$100 Million Steel Plant In Mbarara". Retrieved 21 April 2014. ^ Turyakira, Fred (28 December 2010). "Private Hospitals Urged To Implement Government Programmes". New Vision. Archived from the original on January 20, 2015. Retrieved 21 April 2014. ^ "About Mayanja Memorial Hospital". Mayanja Memorial Hospital Foundation. Archived from the original on 17 October 2014. Retrieved 21 April 2014. ^ "About Uganda Bible Institute". Uganda Bible Institute. Retrieved 21 April 2014. Wikimedia Commons has media related to Mbarara. Wikivoyage has a travel guide for Mbarara.